*This post will be upsetting to most readers because it discusses a terrible event that should never have happened but continues to be repeated. 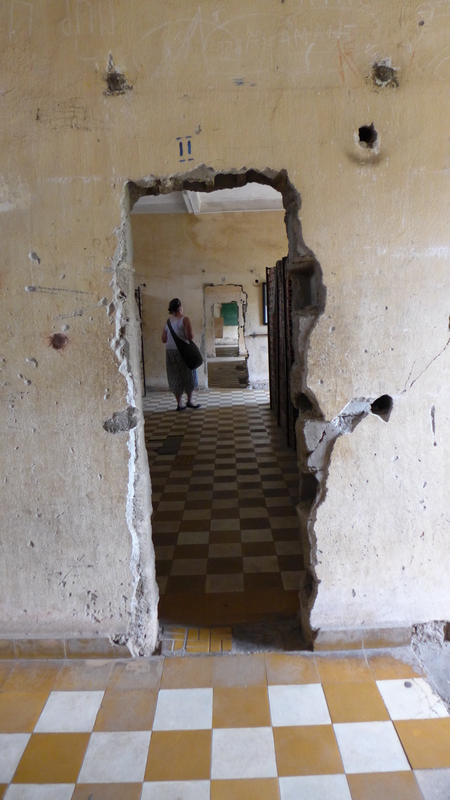 Yesterday was the 40th anniversary of the Khmer Rouge evacuation of Phnom Penh. 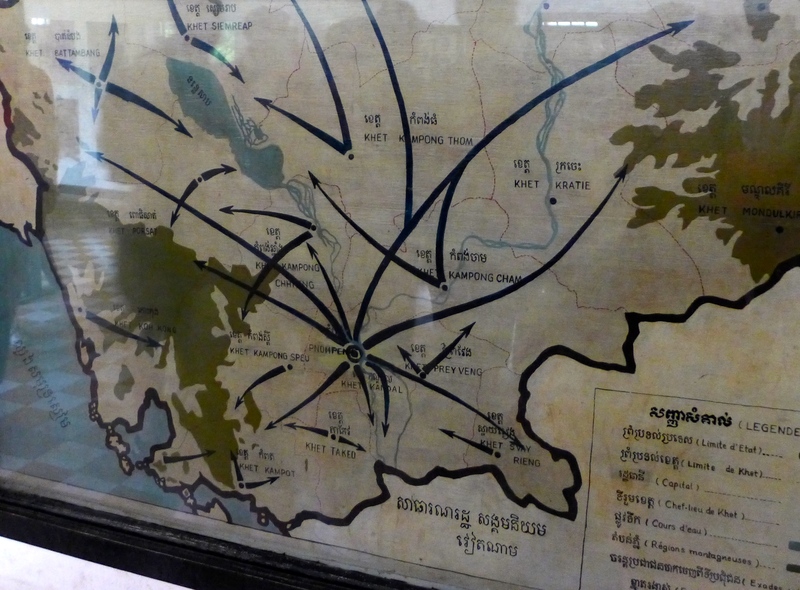 Tanks rolled through the Cambodia’s capital city and the population was forced to march back to the countryside to grow crops like the Chinese Communists peasant society. Below is a map of the evacuation. 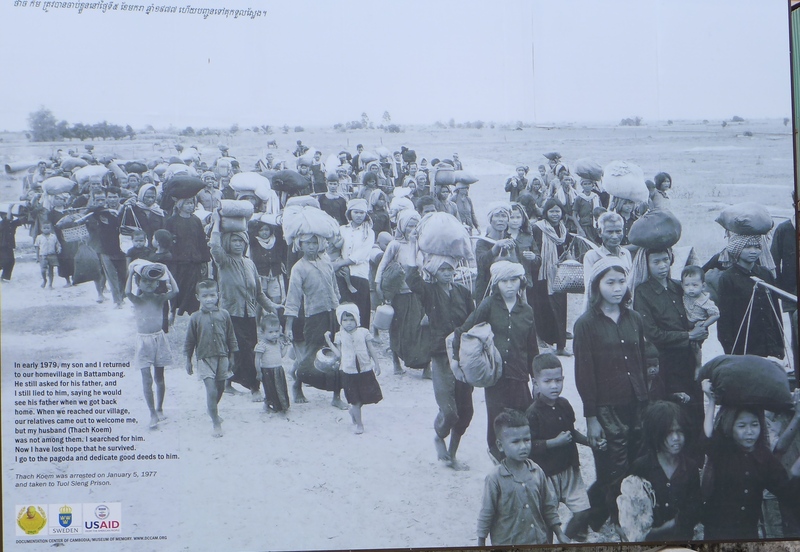 Over the next four years, nearly 2 million people were exterminated as Pol Pot ‘purified’ the population. There are enough similarities to Nazi Germany that I can’t quite fathom this tragedy was still happening in 1979 not 1939. I visited Cambodia less than four decades later and the country is still recovering. 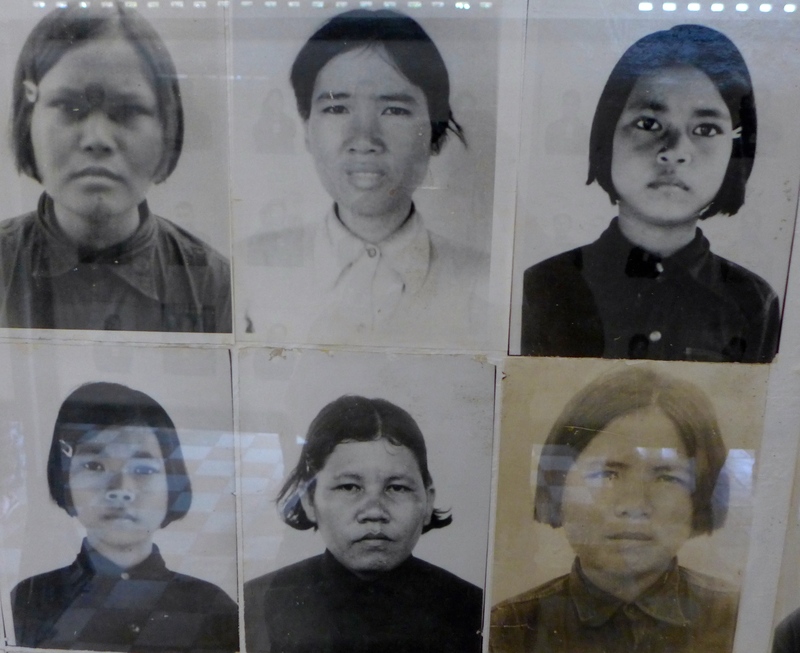 One of the more noticeable results of the genocide is the absence of older Cambodians. In 2014, the population was estimated at 16 million but only 9% of the population was over the age of 55! Today, the median age of the Cambodian population is 24.1 years-old. In the States, it’s 36.8 years-old. 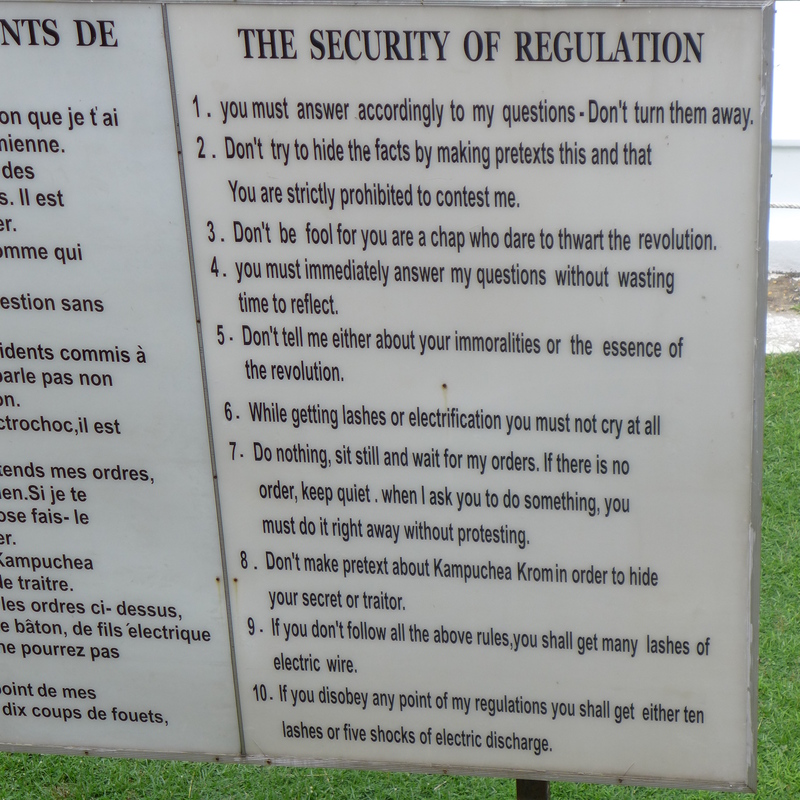 One of the elders I met had a spectacular story of surviving Pol Pet’s regime. This adorable man is Bou Meng and I met him on a visit to the Tuol Sleng Genocide Museum or Security Prison-21 (often called ‘S-21’). In 1975, S-21 was a Phnom Penh high school. 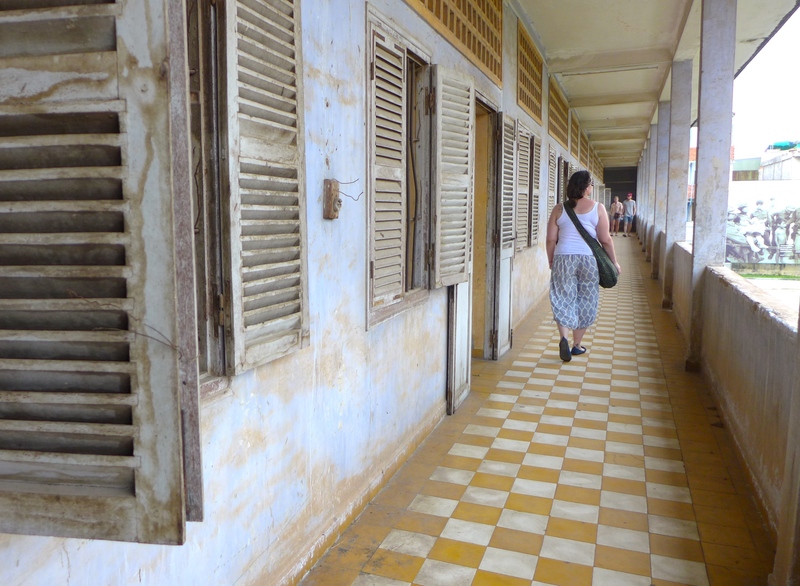 Tuol Sleng is a popular tourist destination for both local and foreign visitors interested in learning about Cambodia’s recent history and that history weighed heavy on me as I walked the corridors of this school. 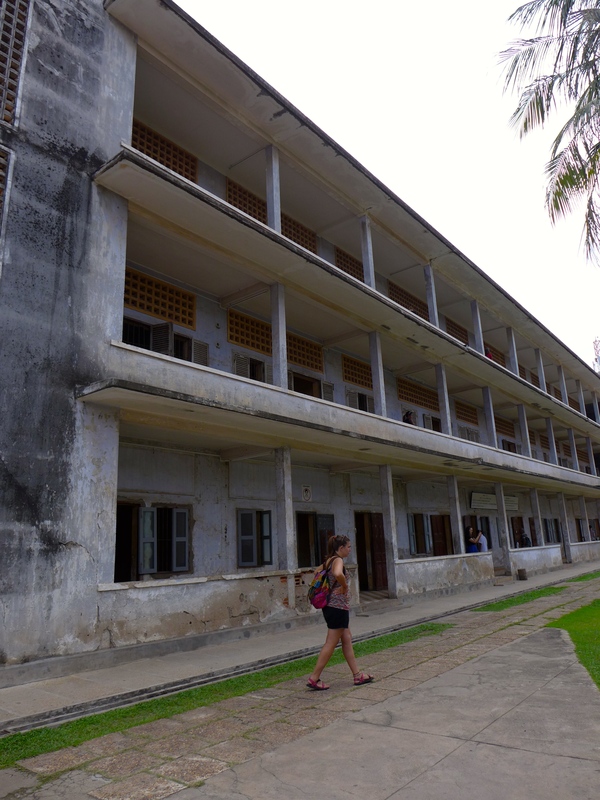 Most of the rooms of the school have been left empty except for leg chains or a steel bed frame but brick cells have been built into the classrooms of one of the buildings. 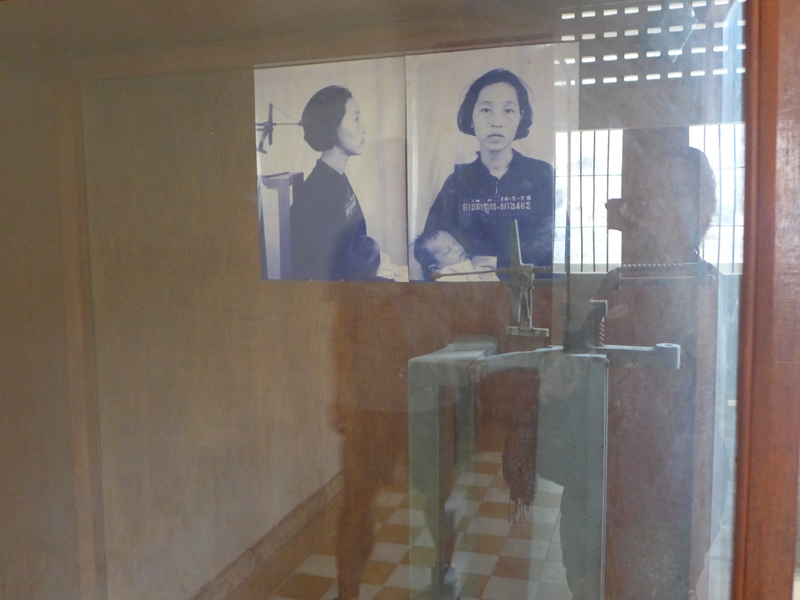 Other rooms were filled with photographs like these, which documented each prisoner in a very systematic way. These photographs and detailed logs immediately brought to mind the comprehensive record-keeping done by the Nazis. The bendable, metal clips that these girls use to pull back their bangs are just like the ones I had growing up. I have to keep reminding myself that these grainy black and white photos were taken less than 40 years ago. Below is the ‘chair’ used for procuring uniform photographs. Both men were spared because of a certain skill they possessed that could help Pol Pot. Chum Mey was a highly skilled at repairing machines for the armed forces. 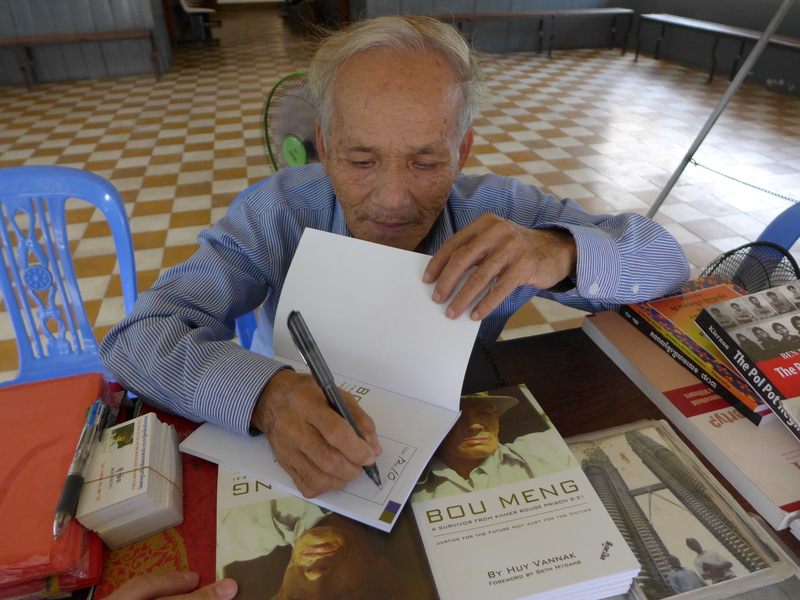 Bou Meng was an artist, which normally would have marked him for immediate execution along with the scholars; but his artistic talents were used to produce Pol Pot’s likeness. Drawing propaganda posters of a tyrant kept him alive. It is remarkable that he voluntarily comes back to the place where he was imprisoned. 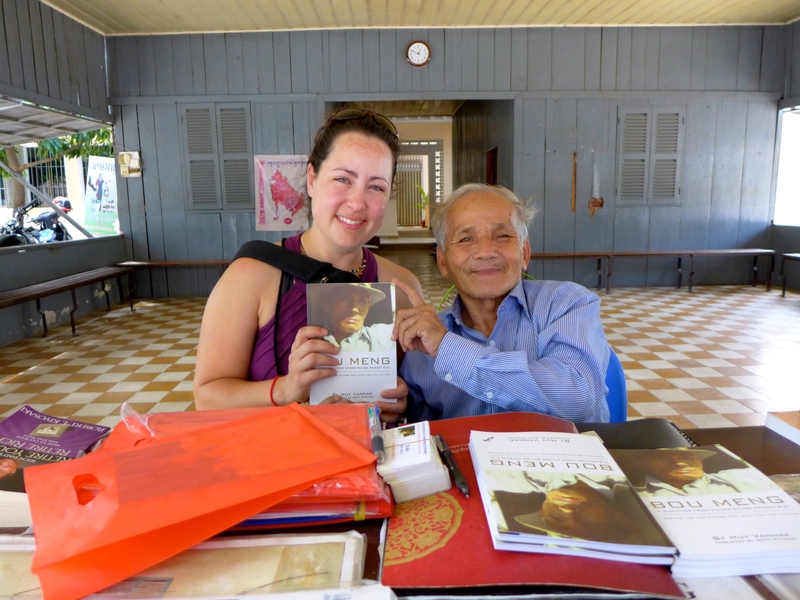 He comes to tell tourists about Cambodia’s history and I got a bit misty-eyed when Bou handed me his book. A big fat tear rolled down my face as he leaned over to hug me. 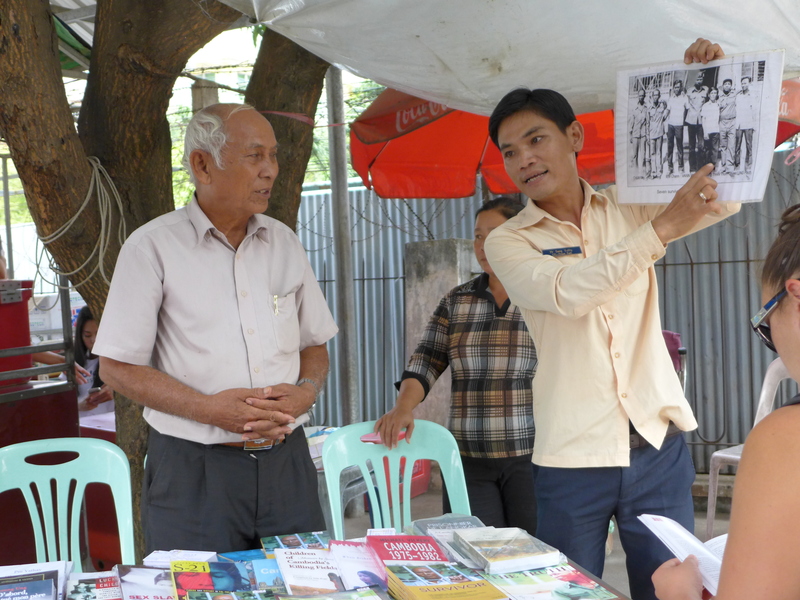 whoa.. you met Bou Meng, the artist from Tuol Sleng? That’s pretty incredible. Considering that during the Khmer Rouge killed off all the education, the industralized, the religious, and the artists, you’d think they would have killed him- except they used him to meet their own needs, to document their atrocities. *shiver* It really is amazing that he is still alive, and even more so, that he returns to the place where he witnessed and drew all these horrible acts of torture and trauma.